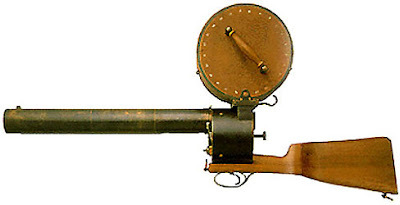 One of the first motion picture cameras was a weapon. In 1882, French physiologist Étienne Jules Marey used his Fusil Photographique, or “Camera Gun”, to photograph a flock of birds in flight. Marey’s device consisted of a photo magazine bolted atop the armature of an ordinary shotgun. A lens was placed at the end of the barrel, enabling Marey to film his subject. By squeezing the trigger repeatedly, Marey obtained a series of exposures that, when shown in sequence, revealed the actual motion of a bird in flight. The fact that one operated the Fusil like a gun is of remarkable significance. By aiming the Fusil, one constructed the subject of the photograph as a target. Brings a whole new meaning to "shooting a picture"!